One of more than 500 Oregon spotted frogs reared at Woodland Park Zoo that were released into the wild last week. Photo by Jeremy Dwyer-Lindgren/Woodland Park Zoo. Precious frog. That's the meaning of Rana pretiosa, the scientific name for the Oregon spotted frog, and a fitting one for a disappearing native. 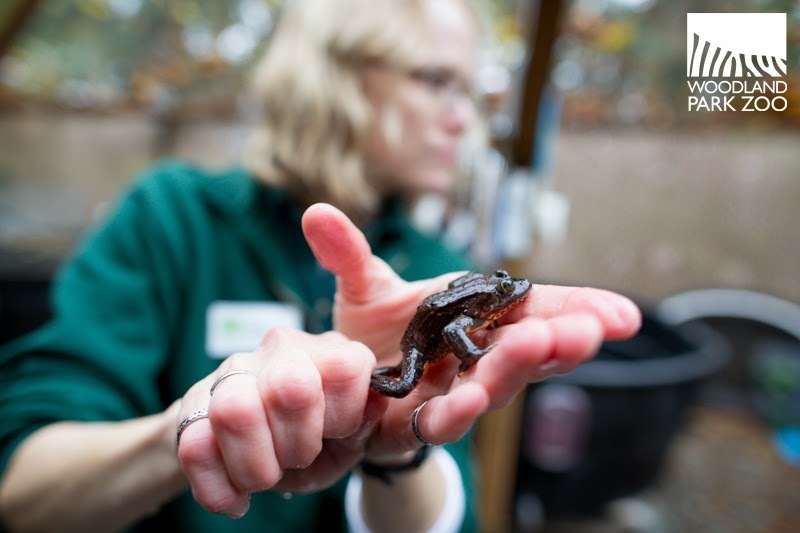 But there's good news to celebrate: more than 500 Oregon spotted frogs reared at Woodland Park Zoo were released last week into marshy wetlands at a protected site in Pierce County. 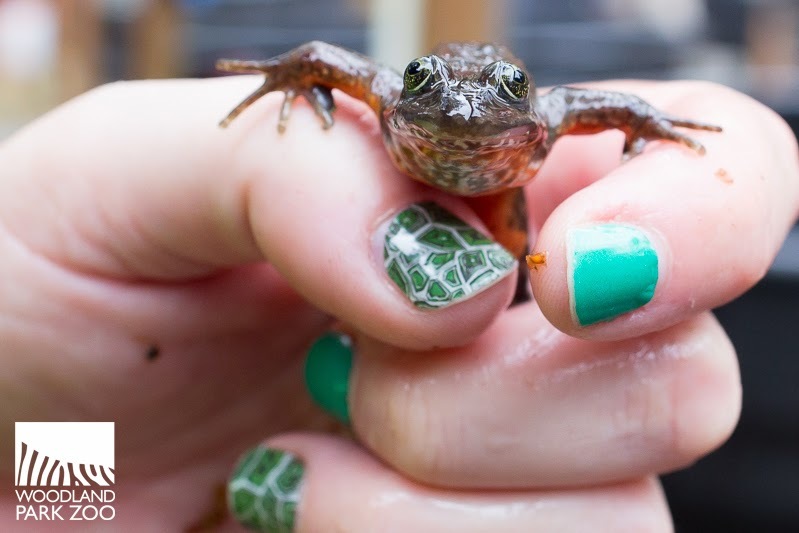 These precious frogs will help rebuild the wild population in their native Northwest. Dr. Jennifer Pramuk, Woodland Park Zoo curator, packing frogs for an early morning release. Photo by Jeremy Dwyer-Lindgren/Woodland Park Zoo. 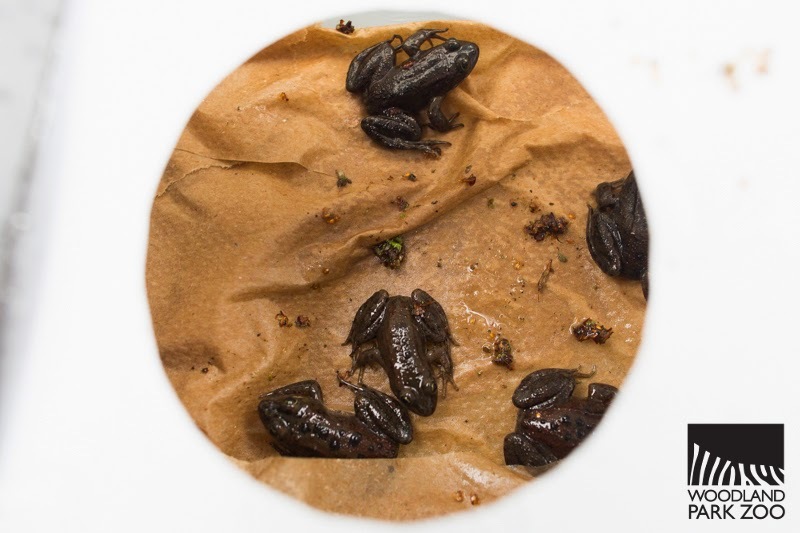 The frogs were collected from wetlands as eggs and placed at the zoo for hatching and rearing for several months in a predator-free home as they transformed from tadpole to juveniles. This head start increases their chance for survival by giving them a safe place to grow until they are large enough to avoid predators. The frogs were packed into containers and transferred from the zoo to the release site in Pierce County. Photo by Jeremy Dwyer-Lindgren/Woodland Park Zoo. Washington declared the Oregon spotted frog an endangered species in 1997, and on August 28, 2014, the U.S. Fish and Wildlife Service listed the frog as a threatened species under the Endangered Species Act. It historically ranged from southwestern British Columbia to northeastern California. 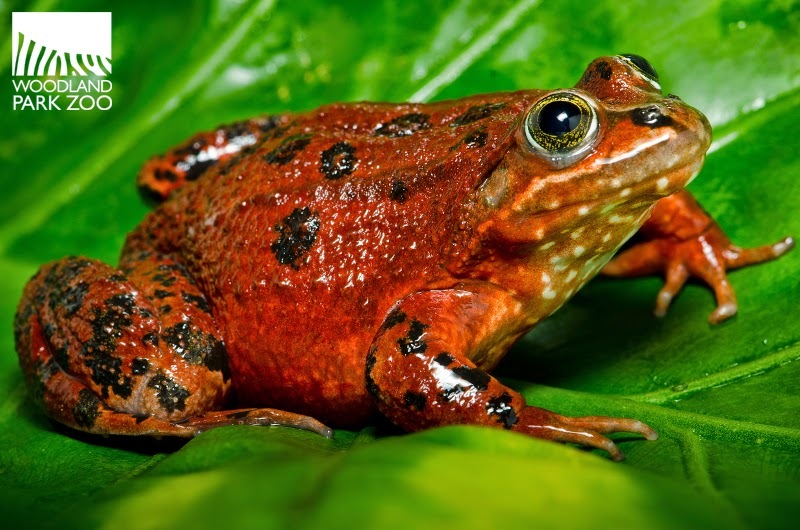 However, scientists have seen populations plummet, driving the frog toward extinction. 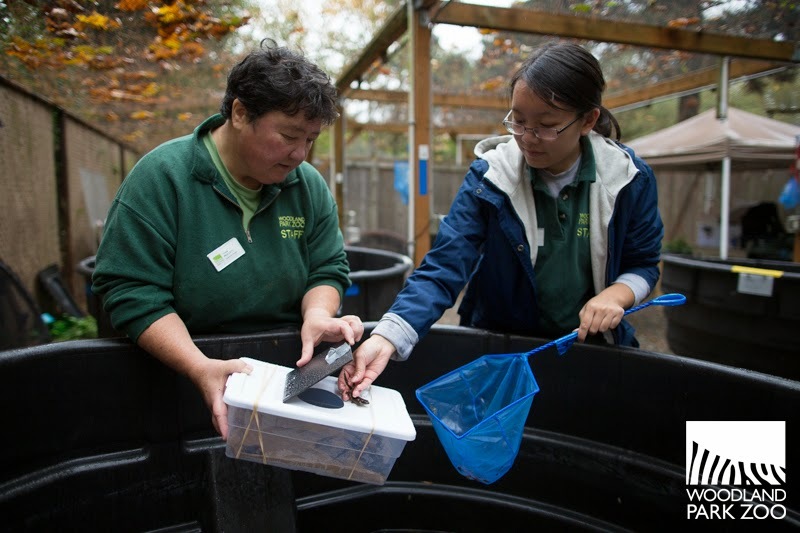 Transferring frogs from the zoo's rearing facility into temporary containers before the release. Photo by Jeremy Dwyer-Lindgren/Woodland Park Zoo. The native amphibian has lost ground to habitat loss from draining and development, disease and the introduction of invasive species such as the American bullfrog. An adult Oregon spotted frog at Woodland Park Zoo. Photo by Ryan Hawk/Woodland Park Zoo. Saving these frogs isn't just the work of conservationists and governments—you can help at home too! Eliminate the use of pesticides in your garden. Pesticides can wash into waterways, polluting them. Use native plants in your garden, which require less water and fertilizer to maintain. Call a local animal shelter when you need to find a new home for an unwanted pet or animal. Releasing pets carelessly into habitats can displace native species and disrupt ecosystem health. Share this story to encourage your friends to join you in supporting wetlands conservation for the benefit of wildlife and people.